Jourdan Williams hit a walk off two run homer in the bottom of the eighth inning to give Western Oregon a 3-1 win over Saint Martin’s in the first round of the GNAC Championships in Richland, Washington. The Saints took a 1-0 lead into the bottom of the seventh inning and Taviah Jenkins did all that she could to hold back the Wolves. The first batter of the inning, Raina Reece, lined a ball into the gap in right center but Jenkins cut it off and caught Reece trying to stretch the hit to a double. 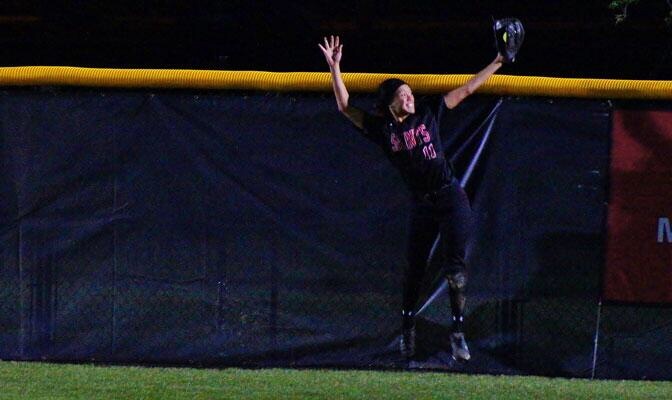 She then reached up and robbed Ashlie Garner of a home run to record the second out of the inning. But Danielle Hannan singled on the next at bat and Melanie Pfeiffer drove her in with a double to even the game at one all and send it to extra innings. Sam Munger and Kellie Demianew battled in the circle but it was Demianew who got the big win giving up just one unearned run over eight innings. Munger went 7 1/3 innings and gave up three earned runs. The Saints now face an elimination game on Friday at 4:30 PM against Western Washington. Posted on May 2, 2014, in Baseball, Black Hills HS, Capital HS, College, High school, Olympia HS, Saint Martin's University, Soccer, Softball, Tumwater HS. Bookmark the permalink. 4 Comments. Capital will host the winner of Tuesday’s Black Hills/Tumwater match on Saturday night next week. Thanks. Updated. Couldn’t find that score anywhere. One of the soccer players alerted me after the game. Even had they lost, they would have still won the EvCo outright with the Aberdeen lost.